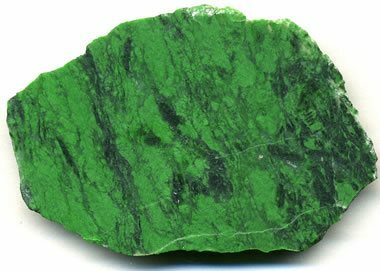 Maw Sit Sit: A bright green gem often confused with jade. 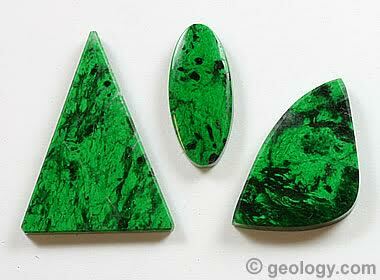 Maw Sit Sit: A group of maw sit sit cabochons showing the typical bright chrome-green color and interesting black pattern. In cabochons, the black kosmochlor often has a much brighter luster than other parts of the stone. Maw sit sit is a green and black gem material that has been confused with jade for hundreds of years. It was once thought to be a variety of jade because of its similar appearance and physical properties. It was often referred to as "chrome jade" because of its bright chrome-green color. Maw sit sit is not a jade. Instead, it is a metamorphic rock composed mainly of kosmochlor, clinochlore, chromian jadeite, and albite, with small amounts of eckermannite, chromite and other minerals. Kosmochlor (NaCrSi2O6) is a rare sodium chromium pyroxene mineral that is abundant in some meteorites. It forms the jet-black areas in many polished specimens of maw sit sit and often has a brighter luster than the rest of the material. Chromium-rich jadeite and clinochlore are the main source of maw sit sit’s bright green color. Clinochlore is a magnesium-rich member of the chlorite mineral group. Albite is a common feldspar mineral. Eckermannite is a rare amphibole-group mineral. Jadeite's composition (NaAlSi2O6) is similar to the composition of kosmochlor, and the two minerals form a solid-solution series with chromium substituting for aluminum. There, maw sit sit occurs, along with jade, in veins associated with a large peridotite body that has been heavily metamorphosed. It also occurs as pebbles, cobbles, and boulders in streams and alluvial deposits. Much of the mining is in these alluvial deposits. Maw Sit Sit Rough: A slab of maw sit sit about 6 centimeters across. Image by James St. John, used here under a Creative Commons license. Nice pieces of maw sit sit are much more affordable than high-quality jade. A beautiful cabochon sized for a ring or a pair of matched cabochons suitable for earrings often cost under $100. Maw sit sit is also a nice stone for pendants and men's rings and cuff links. The problem that you will have if you like maw sit sit is finding a store that has it for sale. You will even have difficulty finding a store where anyone on the staff knows anything about it. Maw sit sit is a little-known gem material. It is easier to find online, but be careful because fakes, misidentified materials, and imitations are abundant. Buy from dealers that you trust.